The economy of Texas is the second largest in the United States. It has a gross state product of $1.645 trillion (2017), the second largest in the U.S. As of 2015, Texas is home to six of the top 50 companies on the Fortune 500 list and 51 overall (third most after New York and California). In 2017, Texas grossed more than $264.5 billion a year in exports—more than the exports of California ($172 billion) and New York ($77.9 billion) combined. As a sovereign country (2016), Texas would be the 10th largest economy in the world by GDP (ahead of South Korea and Canada). Texas's household income was $48,259 in 2010 ranking 25th in the nation. The state debt in 2012 was calculated to be $121.7 billion, or $7,400 per taxpayer. Texas has the second largest population in the country after California. In 2014, for the thirteenth year in a row, Texas led the United States in export revenues. Texas exports for 2008 totaled $192.2 billion. In 2002, the Port of Houston was 6th among the top sea ports in the world in terms of total cargo volume; Air Cargo World rated Dallas-Fort Worth International Airport as "the best air cargo airport in the world". The ship channel at the Port of Houston—the largest in the U.S. in international commerce and the sixth-largest port in the world. According to the Tax Foundation, Texans' state and local tax burdens are among the lowest in the nation, 7th lowest nationally, with state and local taxes costing $3,580 per capita, or 8.7% of resident incomes. Texas is one of only 7 states not to have a state income tax. The state sales tax rate, 6.25%, is above the national medium, with localities adding up to 2% (8.25% total). Texas does have a "back to school" sales tax holiday once a year (generally around the first weekend in August) on clothing and footwear under $100. As for Texas's business tax climate, the state ranks 8th in the nation. Property taxes are exclusively collected at the local level in the state, and are generally at rates above the national average. As a whole, Texas is a "tax donor state" with Texans receiving back approximately $0.94 per every dollar of federal income taxes collected in 2005. 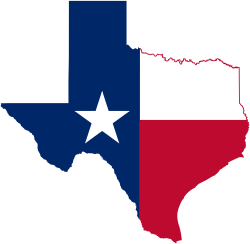 Texas is one of the seven states of the United States with no personal state income tax. In addition, Texas does not allow any lower level of government (counties, cities, etc.) to impose an income tax. This means that, for the residents of Texas, the maximum rate of income taxation is the top rate set by the US Government. Businesses, except for sole proprietorships and partnerships, are subject to a gross margins tax. The state sales tax is set at 6.25 percent. Cities are allowed to impose an additional 1% tax, and additional taxes not to exceed 1% may be approved by voters for any combination of county sales tax, transportation districts, economic development, and/or crime prevention. The average sales tax in Texas amounts to 8.25 percent. The state determines the items subject to sales tax, which all other entities must follow. Motor vehicle sales are subject only to the 6.25% state sales tax. Food, except for prepared food, and non-prescription medicines are among the major items exempt from sales tax. While property taxes are among the highest in the nation, property costs are also among the lowest in the nation. Property taxes constitute the majority of revenue and are collected and kept by local governments, as the Texas Constitution specifically prohibits a state property tax. For real property, counties, cities, and school districts (along with other special districts, such as for a community college or public hospital) can also impose taxes. All property is assessed uniformly throughout the county via the county "appraisal district", and taxes are assessed based on 100% of the property's assessed value. While larger personal property items such as cars, boats, and airplanes can be subject to local taxes as well, it is far less common. Texas has the most farms of all United States both in terms of number and acreage. Texas leads the nation in number of cattle, usually exceeding 16 million head. The sprawling 320,000 deeded acre (1,200 km²) La Escalera Ranch, located 20 miles (32 km) south of Fort Stockton, Texas, is one of the largest cattle ranches in the Southwestern United States. The state leads nationally in production of sheep and goat products. Texas is king of cotton leading the nation in cotton production, its leading crop and second-most-valuable farm product. Texas is a leader in cereal crop production. Three counties in the state—Colorado, Wharton and Matagorda—take advantage of water from the Lower Colorado River Authority to grow rice and are responsible for about 5% of annual U.S. rice production. Texas is also a large producer of watermelons, grapefruits, and cantaloupes. Lyndon B. Johnson Space Center, the center of the National Aeronautics and Space Administration (NASA), is located in Houston. It is a leading hub for the Aeronautics industry. The National Space and Biomedical Research Institute is headquartered in Houston. Dallas-Fort Worth International Airport, located nearly equidistant from downtown Dallas and downtown Fort Worth, is the largest airport in the state, the second-largest in the US, and the fourth-largest in the world. In terms of traffic, DFW is the busiest in the state, the third-busiest in the nation, and the sixth-busiest in the world. The airport serves 135 domestic destinations and 40 international. DFW is the largest and main hub for American Airlines, one of the world's largest in terms of total passengers-miles transported and passenger fleet size. Texas's second-largest air facility is Houston's George Bush Intercontinental Airport (IAH), the largest hub of United Airlines. IAH offers service to the most Mexican destinations of any U.S. airport. IAH is currently ranked second among all U.S. airports with scheduled non-stop domestic and international service. Headquartered in Fort Worth, American Airlines is the world's largest airline by passenger miles, passengers carried, and revenue. 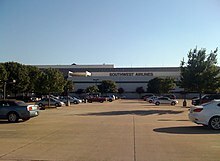 Southwest Airlines, also a leader in the commercial passenger market, is based near Love Field airport in Dallas. Lockheed Martin Aeronautics, the aviation division of Lockheed Martin, is also headquartered in Fort Worth, and the company's Missiles and Fire Control division is based in nearby Grand Prairie, along with the American division of Airbus Helicopters, Airbus Helicopters, Inc.. Bell Helicopter is headquartered in Fort Worth as well. Texas is home to two of the United States Army's largest facilities (in terms of geographic size), Fort Hood in Central Texas near Killeen and Fort Bliss near El Paso. In addition, Fort Sam Houston in San Antonio is home to the Brooke Army Medical Center, one of the Army's major hospitals and its only burn facility, and the Corpus Christi Army Depot in Corpus Christi, Texas is home to the world's largest helicopter repair and maintenance facility. The United States Air Force operates several bases in the state – Sheppard (Wichita Falls), Dyess (Abilene), Goodfellow (San Angelo), Laughlin (Del Rio), and Lackland and Randolph (San Antonio) Ellington Airport, (Houston). The United States Navy operates Naval Air Station Joint Reserve Base Fort Worth (the former Carswell Air Force Base facility) as well as NAS Corpus Christi and NAS Kingsville. Two divisions of Lockheed Martin have their divisional headquarters in the DFW area – Lockheed Martin Aeronautics in Fort Worth (where the F-16 Fighting Falcon, the largest Western fighter program, is manufactured, as well as its successor, the F-35 Lightning II and the F-22 Raptor) and Lockheed Martin Missiles and Fire Control in Grand Prairie. Fort Worth is also the home of Bell Helicopter Textron, which manufactures several helicopters for the military, including the V-22 and the H-1, on which final assembly is performed in Amarillo. Furthermore, three major defense service contractors (DynCorp, AECOM, and DXC Technology) have substantial operations in Fort Worth. Other major defense contractors with DFW presence include Boeing (Richardson), Rockwell Collins (Richardson), Vought Corporation (headquarters in Dallas; facilities in Dallas and Grand Prairie), Raytheon (plants in Garland, Dallas, and McKinney), L-3 Communications (plants in Arlington, Carrollton, and Greenville; also has a facility in Waco), BAE Systems (facility in Fort Worth), Leonardo DRS (Dallas), Hewlett Packard Enterprise and NTT Data (Plano), Alliant Techsystems (facility in Fort Worth), and Elbit Systems (facility and US headquarters in Fort Worth). The Defense Contract Audit Agency maintains its Central Region office in Irving. Outside the DFW area, KBR (the former Halliburton subsidiary) maintains its headquarters in Houston, while the Southwest Research Institute is located in San Antonio. BAE Systems also manufactures the Family of Medium Tactical Vehicles at its facility in Sealy, Texas. Texas is one of the major hubs in the U.S. for development of computer components, systems, software and information infrastructure. Austin, Dallas, and Houston are the major centers for this industry in Texas. The Austin area is often nicknamed "Silicon Hills" because of the concentration of semiconductor design companies including AMD, Cirrus Logic, Freescale Semiconductor, Intel and Silicon Labs. 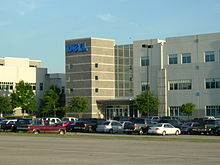 Dell's headquarters is located in the city's suburb, Round Rock, and major offices for Google, Facebook, EA Games, and Apple are also open in the Austin area. Austin is also the home of the Texas Advanced Computing Center at The University of Texas at Austin. Dallas is the birthplace of the integrated circuit. The North Dallas area is called the "Telecom Corridor" or the "Silicon Prairie" for the area's high concentration of information technology companies such as Texas Instruments, Perot Systems, and EDS, as well as telecommunications giant AT&T. San Antonio is the home of cloud computing giant Rackspace, as well as computing pioneer Datapoint. Harris County-based Compaq, was once one of the world's largest computer companies. After Compaq's merger with Hewlett-Packard, the new owner currently employs more employees in the Houston area than anywhere else in the world. Texans consume the most energy in the nation both in per capita and as a whole. Since 2002, Texas has operated under a mostly deregulated electricity market (however, areas where electricity is provided by either a municipality or a utility cooperative are not always subject to deregulation). Several of the major oil companies have headquarters in Texas, including BP (Houston), ConocoPhillips, Marathon Oil (Houston), Exxon-Mobil (Irving), Tesoro, and Valero (San Antonio). Texas is a global leader in the energy industry and Houston is the energy capital of the world. Since 2003, Texas state officials have created various initiatives like the Texas Enterprise Fund and the Texas Emerging Technology Fund to develop the economy of Texas. Texas is a leader in alternative energy sources, producing the most wind power of any state, as well as small solar powered efforts and the experimental installation of wave powered generators. Texas also is home to many of the world's largest oilfield services firms including Halliburton, Schlumberger and Dresser. The state has a number of pipeline operators, such as El Paso and Dynegy, along with diversified energy firms such as TXU and Reliant Energy. Texas has a large tourism industry. The state tourism slogan is "Texas: It's like a whole other country." Tourists might enjoy San Antonio and El Paso's Hispanic culture, or Fort Worth western attractions. Galveston, Corpus Christi, and Padre Island are some of the popular Texas resort areas located on the Gulf of Mexico. Houston is Texas' leading convention city along with its Southern culture. Dallas is also one of the nation's leading convention cities as well as San Antonio. Professional and college sports are dominant in both Dallas and Houston. Texas is a top filmmaking state. Austin is now one of the leading filmmaking locations in the country. The exteriors for the popular soap opera Dallas were filmed on Southfork Ranch, a location near Plano, Texas. From 1995 to 2004, more than $2.75 billion was spent in Texas for film and television production. The Texas Film Commission was founded for free services to filmmakers, from location research to traveling. Also many Hollywood studios are relocating parts of their production divisions to the Austin, Houston, and Dallas areas. The media conglomerate iHeartMedia is based in San Antonio, Texas. Video game developers Robot Entertainment, Gearbox Software, and 3D Realms are based in the Dallas Fort Worth area, while Retro Studios, Armature Studio, and Ghostfire Games are based in Austin. Cinemark Theatres which is one of the largest movie theater chains is also based in the Dallas Fort Worth area. Healthcare is a growing industry in the state of Texas. The Texas Medical Center, located in southwest Houston, is the largest medical center in the world. It is home to The University of Texas Health Science Center which trains medical students and residents and includes The University of Texas M.D. Anderson Cancer Center, a global leader of cancer research and treatment. The medical complex also hosts a private medical college, The Baylor College of Medicine. The University of Texas medical system has additional branches in Dallas, San Antonio, Tyler, and Galveston. The South Texas Medical Center in San Antonio with nearly 27,000 employees has a $14.3 Billion economic impact on the state of Texas. In addition to these facilities, the Texas College of Osteopathic Medicine, the Texas A&M Health Science Center,, and Texas Tech University Health Sciences Center in Lubbock and El Paso provide the state with a total of nine centers of medical research. ^ "Gross domestic product by state (millions of current dollars)". Bureau of Economic Analysis. Retrieved March 21, 2018. ^ "State Rankings-Statistical Abstract of the United States-Persons Below Poverty Level". U.S. Census. Retrieved March 4, 2012. ^ DeVore, Chuck (February 7, 2013). "Texas vs. California - myth-busting time". San Francisco Chronicle. Retrieved October 6, 2013. ^ "American FactFinder". U.S. Census. Retrieved March 4, 2012. ^ "Civilian Labor Force in Texas". St. Louis Fed. September 20, 2013. Retrieved March 20, 2015. ^ "Texas Economy at a Glance". United States Department of Labor. January 1, 2015. Retrieved March 20, 2015. ^ "State Government Tax Collections Viewable Data". Comptroller of Texas. Retrieved September 24, 2015. ^ "Gross domestic product (GDP) by state (millions of current dollars)". Bureau of Economic Analysis. Retrieved June 29, 2017. ^ "FORTUNE 500 2011: States". CNN. ^ "State Exports for TEXAS". United States Census Bureau. Retrieved October 29, 2013. ^ "State Exports for CALIFORNIA". United States Census Bureau. Retrieved October 29, 2013. ^ "State Exports for NEW YORK". United States Census Bureau. Retrieved October 29, 2013. ^ "In Opinion: If states were countries by economic output, California would be France". Newsweek. June 11, 2016. Retrieved June 30, 2017. ^ Fortune 500 companies - Texas.CNN Money. Retrieved on October 28, 2013. ^ ITA. "State Reports - Index". Trade.gov. Retrieved March 4, 2012. ^ "World Port Rankings 2002, by metric tons and by TEUs". American Association of Port Authorities. Archived from the original on July 13, 2006. Retrieved July 26, 2006. ^ "Air Cargo World's Air Cargo Excellence Survey". Air Cargo World. Archived from the original on March 25, 2006. Retrieved April 29, 2006. ^ a b c d e "Texas". Research Areas. The Tax Foundation. 2008. Archived from the original on October 23, 2008. Retrieved October 15, 2008. ^ "State Individual Income Taxes". Federation of Tax Administrators. Archived from the original on October 25, 2006. Retrieved October 12, 2008. ^ "Local Sales and Use Tax". Susan Combs, Comptroller of Public Accounts. October 2011. Retrieved June 13, 2013. ^ "Clothing Sales Tax Holiday". Susan Combs, Comptroller of Public Accounts. January 2008. Retrieved October 15, 2008. ^ Accounts, Texas Comptroller of Public. "Franchise Tax". www.comptroller.texas.gov. Retrieved November 10, 2016. ^ "Sales and Use Tax". state.tx.us. Retrieved March 4, 2012. ^ a b c "The Texas Economy". netstate.com. June 5, 2007. Retrieved April 29, 2008. ^ Koppel, Nathan (March 2, 2012). "Texas Rice Farmers Lose Their Water". Wall Street Journal. Retrieved March 4, 2012. ^ "Facts about DFW". Dallas/Fort Worth International Airport. Archived from the original on June 14, 2007. Retrieved August 4, 2007. ^ "Lockheed Martin, Poland Air Force Celebrate Arrival of Most Advanced F-16 Multirole Fighters in Europe" (Press release). PRNewswire. November 9, 2006. ^ ""Compaq Offices Worldwide"". Archived from the original on December 25, 1996. Retrieved September 6, 2008. CS1 maint: BOT: original-url status unknown (link) Compaq. Accessed September 6, 2008. 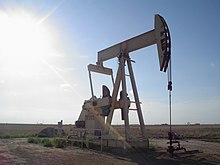 ^ a b "Petroleum Profile: Texas". Archived from the original on September 18, 2002. Retrieved November 7, 2006. ^ a b "Texas Film Commission". Retrieved November 7, 2006. ^ "Top American Hospitals". US News. Retrieved March 4, 2012. ^ "Best Graduate Schools". usnews.rankingsandreviews.com. Retrieved March 4, 2012. ^ "South Texas Medical Center: Facts". Archived from the original on September 24, 2008. Retrieved February 16, 2009. Texas Lyceum Journal: "Harnessing the Lightning: Economic Growth Opportunities for Texas"